Has the shine come off the Kerry Huffman era? The Hamilton Street Heroes return from a dreadful 3/3 in New England last weekend which saw them lose three straight games in regulation, before an overtime-winner in Springfield salvaged things a bit on Sunday. The adversity started back on December 29 at home when a reeling Penguins squad came to town and decided the only way to play the Phantoms was to play dirty. Indeed, their captain got thrown out of the game, got thrown out the next night, and then was suspended for two games. What does that sound like to you? Well, he got called up today, so I guess all is good for him. He’ll need to clean it up if he wants to stay in the NHL. But I digress. It all worked out for the Pens, as it got them the win by getting the Phantoms off their game a bit. 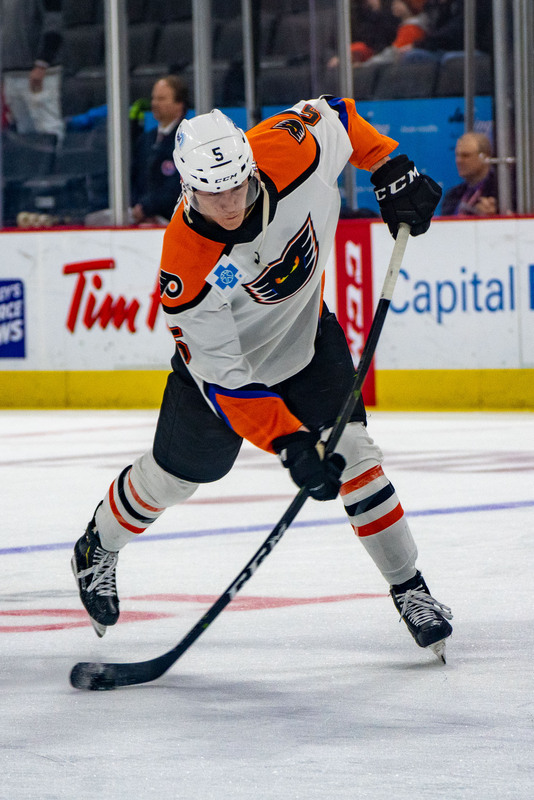 It may have even been in their heads some as they headed to Providence on Friday to face a team who’s had the Phantoms’ number this season and is willing to play a somewhat similar-style physical game. The Phantoms lost 2-4 and were out-shot 22-34 in one of their weakest efforts of the season. Goals were scored by Conner and Vorobyev. It may have even carried over into the Hartford game on Saturday when Branden “dot” Komm got a start, played well, but still took the ‘L’ 1-3 as the offense didn’t seem to show up in the “Tokarski Revenge Game.” They did manage to put 31 shots on ‘Tik’ but alas the 28 the Wolfpack took were enough to beat Komm. NAK had the goal. But Coach Huffman righted the ship on Sunday–mixed the lines a bit and lit a fire–and the team responded with a season-high 44 shots and improving to 4-1 in overtime games this season. The 4-3 final saw goals by Carey, Myers, Bunnaman and Friedman with the game-winner in OT. So is everything falling apart? Or is this just a hiccup? There’s no time to play around, because this weekend we begin another 3/3 as we head into 10 games in 16 days leading up to the All Star break. This stretch will allow the Phantoms to use up some of the “games in hand” on the rest of the division, and may go a long way towards setting the tone for the second half of the season. And, speaking of falling apart, Philadelphia is burning. The Flyers are reeling and you have to think that the changes that will inevitably come will impact the Phantoms–and probably not for the better. NHL players get traded and AHL guys get called up–we’ve got a couple who are ready. Or, prospects are traded from the AHL ranks to acquire NHL talent. Either way we probably lose. Some guys could get sent back down, or AHL guys could get added via trade on the NHL or AHL level. Buckle up–the fact that it could come during such a cluster of games is disquieting. Nothing we can do but hang on for the ride and provide the home fan support that we always do. Despite a 1-3 record in our last four, we’re still 5-4-1 in the last 10 and holding our own in third place prior to mid-week games. In the “top 4” we still hold 3 games in hand on the other three, Charlotte, Bridgeport and Wilkes-Barre. And that will take us right into an MLK-Day matinee in Wilkes Barre. Those seven games in only 11 days. Giddyup! C Steven Swavely was recently awarded with an AHL contract after joining us on a PTO this season, up from Reading. He was also recently named to the ECHL All Stars, which he’ll miss unless he’s somehow sent back. He’s been solidifying that fourth line recently, getting Goulbourne involved in the scoring, and winning face-offs. He’s a good guy to have around, even if you don’t always see his name in the box score. F Cole Bardreau and F David Kaše remain out with injury. C Michael Huntebrinker was injured too, although that wasn’t initially disclosed. Bardreau’s re-injured hand was thought to probably keep him out on the longer-term, but I’ve heard rumblings that he could be back sooner than I first anticipated. Kaše was skating and thought to have a possibility to return after the New Year, but I haven’t heard any updates at this juncture. Huntebrinker is said to be available now, and indeed played in the Hartford game. Lines for the weekend, presented in reverse order, show some shuffling, culminating in the Sunday Springfield lineup. Thoughts: The top two lines a bit interchangeable in this iteration. Those on-site observed Leier and Twarynski swapping sides during line rushes. Will be interesting to see if this lineup results in any changes this weekend, or if it was just a one-off to try to get things going. Thoughts: Remember, the order of the lines not always fully indicative of their ice time or role in the game. This being the second of the 3/3 weekend, Huff gets Hunty and deHaas into the mix. Hunty joins Bunny and Twarynski on the de facto fourth line of first-year-ish players. Misha centers the Carey line with Leier on the right, while Vecchione centers NAK with Conner on the left. Willcox joins his old mate Brennan in the top pair, while deHaas joins Friedman in the pairings. I feel like this was mostly done to accommodate Bunny and deHaas, but there also could be some thoughts to protecting Komm and/or foreshadowing what we saw in Springfield the next night. Thoughts: This is the lines that Coach Huff had been using since he took over, and very similar to what we had seen just prior to that. With the 3/3 some changes were going to happen over the weekend. As you look at the next two nights you can see where he went. As mentioned above, it will be interesting to see how this plays out going forward into this weekend. Look for “Hockey Night” on Friday afternoon before the game with a preview of Binghamton and some notes about downtown. Saturday’s preview might be abbreviated, but should get you set up for Saturday. I am assuming that this is an honest question. Can I pick option “C”? A month ago, I would have considered this next weekend as a 5-6 point gain. After watching the last 6 games, I will be happy with adding 4 points. I have noticed a drop-off in consistency and structure over the past two weeks, especially in the defensive end. The Providence game was awful defensively. Not sure if anyone noticed, but by the second period, the D lines were completely scrambled from what we have been used to seeing. The pairs were back to normal on Sunday. At the end of the day, this team still has above average talent on both ends and I think that will keep them above water. I pick Option “C”: entering an extended swoon. I expect them to play near .500 and stay in the top 5 in the division for a couple more weeks. After that, let’s hope for a post ASG revival. I think the question was mostly rhetorical—but also mostly aimed at folks who perhaps didn’t pay attention to the results of last weekend, much less watch the games in person—with the other important exception of the Phan Club trip. I think it’s probably too small a sample to draw any real conclusions—be it of the team or of Coach Huff, whom everyone seems to like, without exception. The point I was probably trying to make the most is that this is an important and busy stretch of games—and not to be surprised if the Flyers totally screw it up for us.